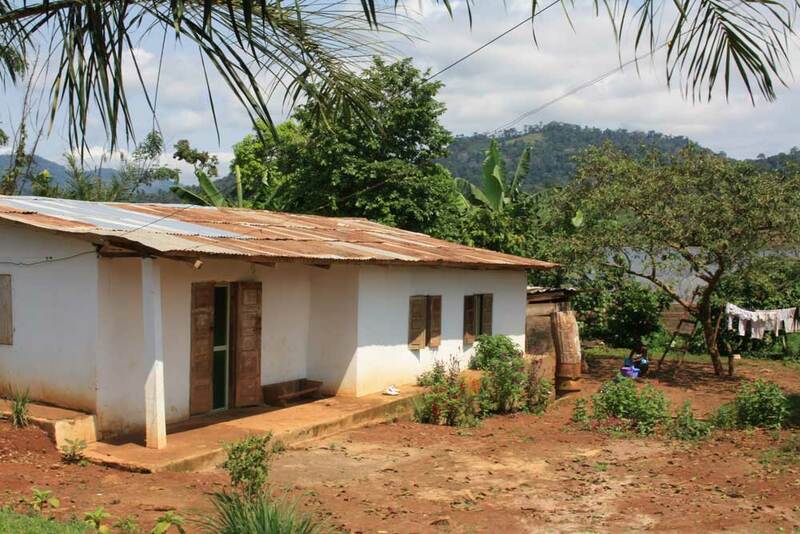 ABOVE: One of the renovated houses from ARCHIVE’s Cameroon project. Building on an existing structure, the intervention involved screening windows, doors, and eaves, as well as repairing the walls and roof. Although we have all the necessary tools to eradicate malaria, it remains a life-endangering disease affecting millions throughout the world. The use of insecticide treated nets (ITNs) and insecticide residual spraying (IRS) has significantly increased in the past fifteen years and has become the dominant strategy for malaria control. This has led to important decreases in malaria prevalence and the disease’s incidence rates. Mortality rates due to malaria have fallen by 60% globally since 2000. An estimated 600 000 million cases of malaria have been prevented in sub-Saharan Africa. Countries like Namibia have seen a 99% decrease in case incidence since 2003. Combined with effective diagnostic testing and treatment, these methods work miracles. However, malaria remains a challenge in some areas that do not share the same promising trends and results – a problem that the World Health Org (WHO) is quite concerned about. Parasitic resistance to antimalarial drugs and vector resistance to insecticides are serious threats to successfully combating malaria today. In Cameroon, where ARCHIVE recently completed a 3-year project, despite growing efforts by the government to control malaria with the standard strategies, malaria remains one of the top three causes of morbidity and mortality, partially due to growing drug and insecticide resistance but also due to limited access to bed-nets among the poorest and most vulnerable. This fact is disconcerting but we have another, often overlooked, weapon to combat this deadly disease: housing. Home improvements can overcome issues of resistance, accessibility and sustainability. 80% -100% of malaria transmission occurs indoors in sub-Saharan Africa: the home is a high risk area that can easily be transformed into a safe haven. Screening windows, doors, eaves and repairing walls and roofs, have proven to substantially reduce the exposure of humans to malaria vectors and decrease the rates of malaria incidence by 40%-80%. Historically, screening windows and doors have had an important role in eliminating malaria in Western Europe. Imagine the multiplied effects of combining housing improvements with our current methods. Despite its potential, housing is rarely taken as the default form of malaria control as opposed to the dominant paradigm of malaria control based on insecticide use. Why? The first reason pertains to monitoring and evaluation. In the short-run, effects of spraying and bed-nets are more easily measured and conveniently administered. The number of direct beneficiaries and lives saved is comfortably computed on the number of bed-nets delivered and houses sprayed. However, this is difficult to do for housing improvements that are tailored and multiple fold. Improvements cannot be simply homogenized, delivered and distributed. After all, traditional homesteads in sub-Saharan Africa look nothing like the homes in suburban California. Consequently, it is hard to market housing strategies to funders who seek easily scalable and rapid solutions. Secondly, there is the misconception of cost. For a household of 5 people, it costs about $10 a year for ITNs and approximately $30 a year for IRS. These are incredibly cheap options to implement. Housing improvements cost about $50 for a house upfront and can cost up to hundreds depending on the quality of craftsmanship, material and timing. This is indeed more expensive but the reality is that this cost is a one-time expense that does not need to be renewed. In the long-run, housing improvements are cheaper and more sustainable. Funding in our system is disbursed based on projects and not on impact. Many seek a quick and cheap fix that has the least variable cost but mosquito -proofing houses does not fit that profile. The third reason pertains to the responsibility of shouldering that cost. Housing and infrastructure renovation is generally overseen by the private sector and government housing and infrastructure departments. It rarely falls under the mandate of health officials. Yet, housing and health are intricately linked. Housing is most effective for malaria control as an integrated approach combined with conventional methods of prevention. Its impacts on health go beyond malaria prevention to enhancing personal happiness, productivity and family wealth as well. These three challenges demonstrate the struggle to implement alternatives to the dominant paradigm but ARCHIVE Global insists that we do. Insecticides are harmful and unsustainable in the long-run. They transform and severely impact the balance of the eco-system we live in and interact with. Housing improvements are cost-effective and long-lasting. They not only better housing conditions but also health and economic development without affecting the equilibrium of surrounding flora and fauna. We must shift our thinking and go beyond the dominant paradigm. Diseases and their vectors adapt and transform constantly to fight and fit their hostile environments and hosts. We need to address this issue in the same way by continuously thinking of new ways to approach disease control through adaptability, creativity and innovation challenging the dominant paradigm of malaria control.